You might get a lot more than you bargained for! 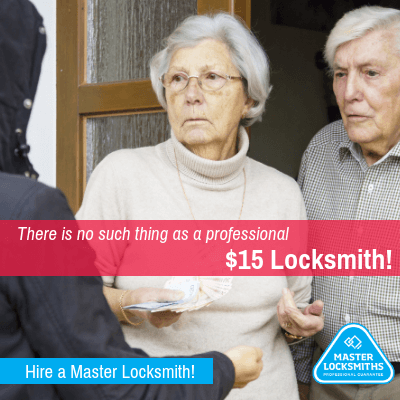 To say it straight away, there is no such thing as a professional $15 Dollar Locksmith. Like there is no such thing as a $3 Gourmet Burger or a $19 Lawyer. However, there are hundreds of businesses online claiming to offer locksmithing services and suggesting that they, in fact, would only charge you $15, $20 or $35. Often they are scammers! So, please trust your intuition because if it sounds too good to be true, it probably is. For many years now “Locksmith Scammers” are luring people in need of emergency services into thinking they would only have to pay a tiny service fee to get their apartment door or car door opened. Unfortunately, in most cases, clients approaching these scammers are left with broken locks, damaged doors, scratched car panels or even shattered windows. And if that’s not enough, scammers often request credit card details upfront and leave clients with bills of up to $800 Dollar. How to know you are not dealing with a Locksmith Scammer? Again, there is no such thing as a professional $15 Locksmith. Professional Locksmiths are charging reasonable prices that consider travel time and amount of work, required tools and products; and of course time of day. Professional Locksmiths simply do not have any interest in taking advantage of you. They run professional businesses in a competitive industry where prices are regulated by supply and demand. Just like with any other trade as well. You probably wouldn’t expect a $15 plumber or $15 electrician either. Ask some questions up front! There are a few things you should check before you hire a locksmith that you have found online, even if you are in an urgent situation. Did you find the business through an ad on Google? Scammers usually can’t gain so-called “organic relevancy” so they have to buy ads on Google. Not all Google ads promote scammers, but if the business just runs ads, it might be a scammer. Is the business using a legit local domain ending such as .com.au or .co.nz? Numbers (NZBN) are entitled to own an Australian or a New Zealand domain. Scammers do not have ABN’s or NZBN’s and, therefore, have to use .com, .info or other foreign domains. Some scammers use the addresses of landmarks, office towers or even big shopping malls to make it look like they would actually run a local business. Is there a legit company with the same or a very similar name?Scammers are sometimes using business names of legit locksmiths or very similar sounding names. Obviously, it’s hard to tell who is who, we would recommend checking both of their websites. In some areas in Australia and New Zealand security businesses such as Locksmiths are required to maintain a license. Check their website for that number and ask when you call. Is the locksmith member of an industry organisation? Businesses Member of a trade or industry association agree to follow a strict code of practice and code of ethics. Is the person you called extremely vague about costs, prices and services? Qualified Locksmiths have a very good understanding of the work or products needed to solve your problem. Therefore you always can expect an accurate estimate up front. Is the person you are talking to able to tell you the name of the person arriving at your house? Often scammers work with international call centres, people there wouldn’t know the name of the “local scammer”. Is the person arriving at your house a qualified locksmith? It is true that in some cases an individual doesn’t have to have a qualification to open your home or car. However, do you really want to have your security-related work done by a layperson? Is the business offering different ways to pay? Often scammers will ask you to pay via credit card so they have full control over what to charge at your premise and even later. Unfortunately, all of the above signs of legitimacy are fakeable, however, in combination, these signs will help you to identify a scammer. If you called a possible scammer and they arrived at your premise, in an unbranded vehicle, not wearing a uniform or any identification, and if the person doesn’t look or act professional, doesn’t have proper tools with them or you just start to get a bad feeling about them, please remember that you can always cancel the job at any time. And if they threaten you, please call the police!